For landing pages or website pages, you can create multi-language content to link the translated versions of your pages on the same subdomain. 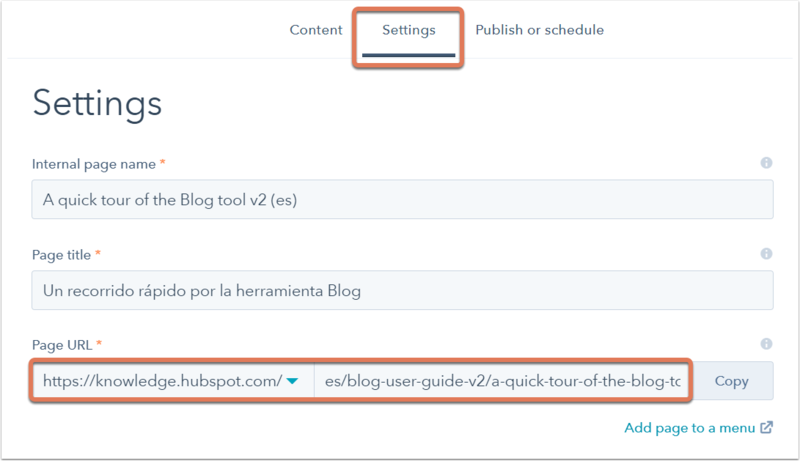 You'll set a primary language for your subdomain in the domain manager, and then HubSpot appends a language code subdirectory to the URL for each translation. You can also set up language code subdirectories for your blog or pages in the Settings tab of the content editor. In the screenshot below, the subdirectory "es" has been added for the Spanish version of the page. In the sidebar menu, navigate to Website > Blog. Scroll down to the Blog root URL field. In the screenshot below, the blog's URL is set to have the subdomain "es", which means all posts will be created on URL paths relative to this listing domain. You can set up as many subdirectories as you need on HubSpot, regardless of your account subscription level. With a Marketing Hub Enterprise account, you can use an unlimited number of subdomains for your brand domain. You can connect language-specific subdomains, as shown in the example below, and use them interchangeably depending on the language of each page. To host multiple language domains, you'll need to purchase each subdomain with a registrar and connect the subdomain to HubSpot. Once connected, you can publish content on the subdomain of your choice from the Settings tab in the editor. Smart content can dynamically update areas of the page with your translated content based on the visitor's preferred language.